No 5 lies at the northern end of Cross Street, c.20m to the south of the boundary of Hoxne Priory (HXN 004). Skynners map shows a building on the approximate site and, although not listed, the property dates to at least the mid 19th century as it is clearly shown on the tithe map (named in the apportionment as 'Cottages and Gardens' owned by Sir Edward Kerrison). The 1st Edition OS marks a well to the south of the house. The Test Pit was located in a flowerbed, c.4m to the south of the house and c.9m west of the road frontage. This showed 0.6m of a soft homogenous topsoil, Context 1, with frequent small stones and post-medieval material. 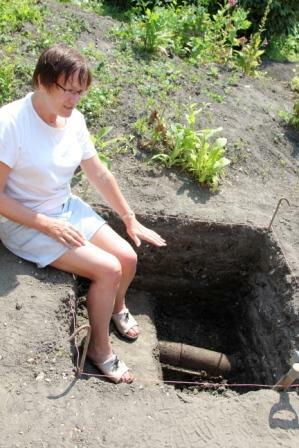 At 0.6m a 19th/20th century ceramic drainage pipe was uncovered running across the centre of the pit. This cut through Context 2, a dark grey/brown clay/silt which extended to at least a depth of 0.75m. Fragments of GRE, IGBW, Rhenish Frechen stoneware, and a sherd of TGE (16th-18th century) were recovered. In addition to other post-medieval artefacts such as ceramic building material and glass, quantities of slag were identified. A small worked flint flake with hinge fracture and limited edge retouch was also identified which may date to the later prehistoric period. The ceramic pipe showed that the upper 0.6m of the pit formed by Context 1 was a heavily disturbed modern topsoil, with much of the finds contemporary with the existing house. The earlier material and Context 2 suggests the presence of a preserved soil horizon which although likely still to be post-medieval in date may pre-date the existing house. There was no sign of any evidence contemporary with the nearby Priory although, as with Test Pit 18, there is potential for such deposits to be present at a greater depth. Prior to backfilling a time capsule was placed at the base of the test pit.